So as it turns out, virtual violence can involve quite a bit more than pulling the trigger of a virtual gun. There are scores of games that not only allow, but require and encourage the player to engage in willful acts of violence in order to progress through the game. The majority of games which I tend to play operate off some setup where the player is directly responsible for violent actions within a game. That is to say, the player exhibits control of an in-game entity to inflict some kind of action at a one to one ratio with the control scheme. First-person shooters are a good example of this, where specific control inputs from the player result in weapon discharges. Controls in fighting games result in various kicks, punches, or other methods of attack. The same principle applies to games where the player controls a vehicle, be it a combat simulation or an aggressive racing event. Defined as such, Burnout: Paradise qualifies as violent since the player is actively encouraged to use his vehicle to damage, disable, and destroy his opponents. But what about games where the player doesn’t directly carry out violent acts? Is a first-person shooter any more or less violent than strategy games which allow you to control scores of troops in large-scale battles? Is it still violence when clicks of a mouse order dozens or hundreds of digital soldiers to go and wipe out dozens or hundreds of enemy troops? If violence can be simply defined as willful intent to cause damage to something, then the vast majority of video games can be classified as violent. Perhaps player intent, and not just the intent of the game developers, can make the difference between certain games being violent or not. When I was a teenager I used to play a licensed NASCAR racing game. NASCAR done right is about as non-violent as you could get. Big blocky cars get on a track and make left-hand turns for hours. No violence there! My teenage brain grew bored of such things very quickly and soon demanded that I drive against the flow of traffic and try to wreck as many cars as possible before my own was battered beyond repair. Because I abused the intention of the game, I turned a non-violent racing game into a carnage simulator. Kerbal Space Program is a sandbox universe where you build giant rockets to explore. Sometimes, you just want to see what happens when you crash a rocket ship into a building! Instruments of science become vehicles of destruction. 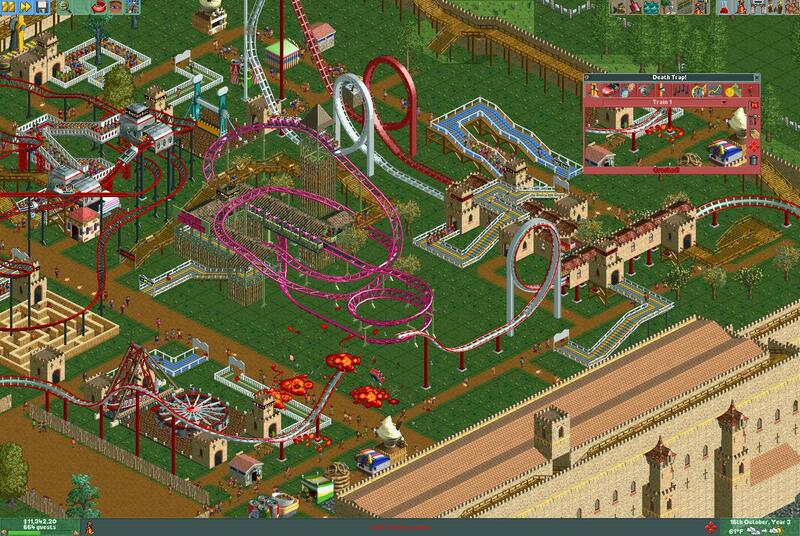 Even the bright and cheery Roller Coaster Tycoon, one of the more joyous games I’ve ever played, contains death and destruction. Roller coaster crashes, resulting either from poor design or malevolence, fill your screen with large explosions and numerous deaths. And I’m going to try and avoid all that for a month. Not only am I going to shun games which encourage violence, I’m going to play non-violent games properly in order avoid causing violent events if at all possible. It’s not my goal to make any kind of a statement by avoiding any particular games. Rather my pledge is simply a response to an observation that most of my preferred games focus on destruction. I want to go a month focused on construction. I want to build some worlds instead of tearing them down. I want to discover a story, not shoot my way through it. After many years of training my brain to know that video games are all about blowing stuff up, I’m giving myself a reminder that gaming is also about creating and exploring wonders. Building a roller coaster with a jump in the tracks and naming it “Death Trap!” does not qualify as an act of non-violent creation. I did the exact same thing with a Nascar game growing up. I guess I wasn’t the only one! Also, in terms of games focused on construction, you should check out Grow Home. I really enjoyed playing it and building the world up. Thanks for the recommendation (and for reading! ); I’ll check out Grow Home!